These Pumpkin Spice Twix Bars are a warm, pumpkin-spiced twist on a classic candy favorite! 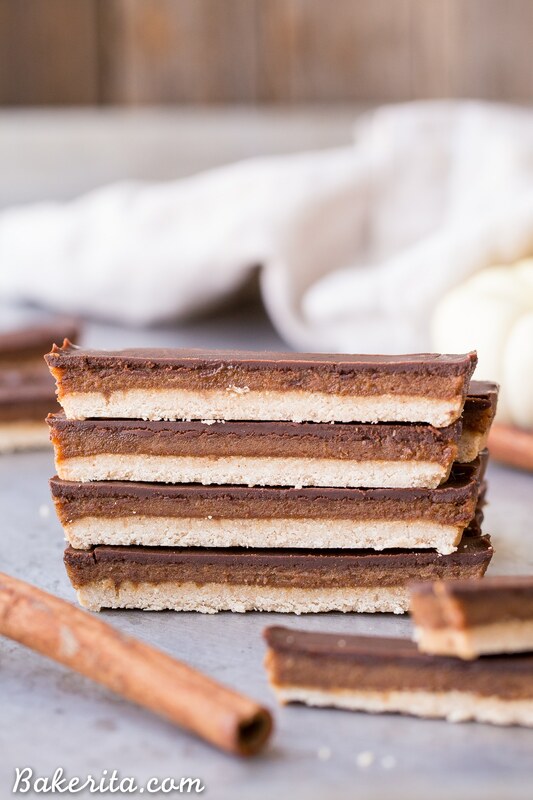 These copycat homemade Twix Bars are gluten-free, paleo, and vegan, and the bold pumpkin spice flavors take them out of this world. October is here. I feel like each month, on repeat, I’m shocked that it’s already so late into the year. And my continuous shock and horror at how fast time flies just makes me feel even older. I guess I better get used to it. Because even though I’m mildly horrified we’re already into October, I’m also thrilled that we’re officially into Fall and with it, all the warm drinks, spiced baked goods, and cozy clothes (even though we’ve still got summer weather here in San Diego). It also means we’re closer to the holidays, one of my most favorite and busiest times of the year, full of cookies and candies and sweets and treats! Also, it’s somehow gone unmentioned so far on here, but I’m in the latest issue of Bake From Scratch Magazine! Bake From Scratch came out with a collab issue with the FeedFeed, and I’ve got a full four recipe spread of gluten-free and vegan treats that are exclusive to the magazine. You can snag your issue here, or get it on newsstands in your local healthy grocery store. 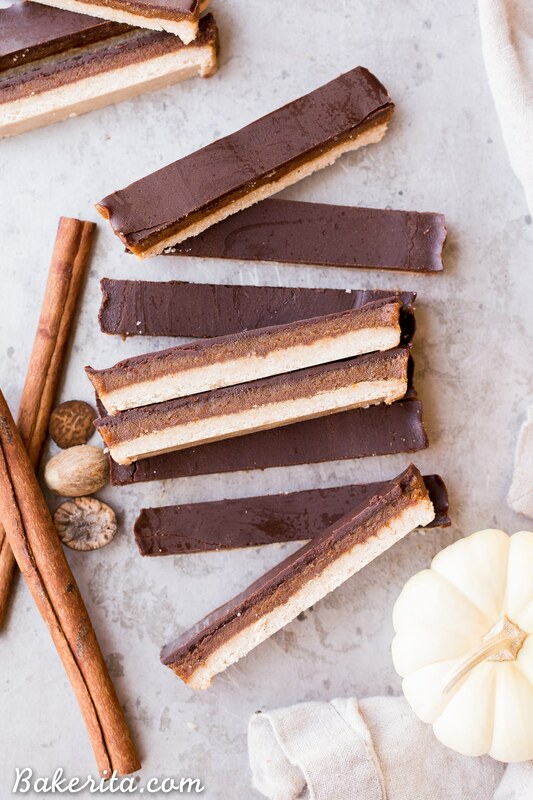 Let’s move on to the topic of the day though: Pumpkin Spice Twix Bars. My, oh my. 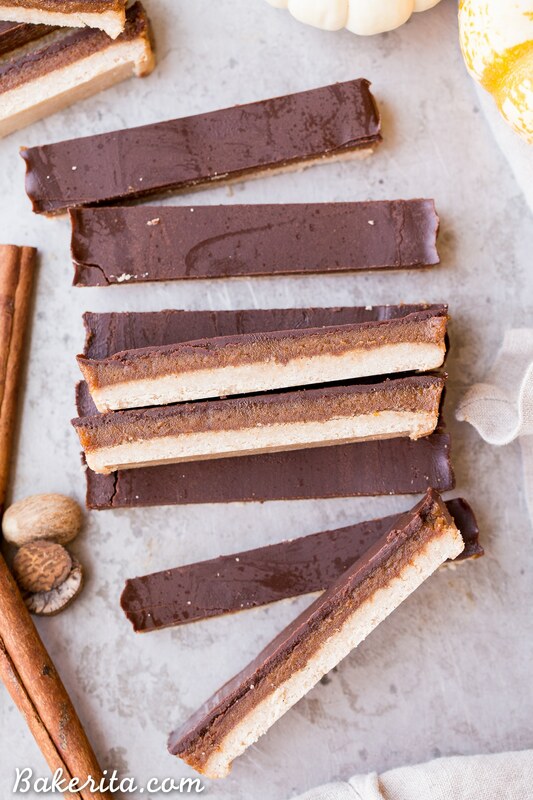 My original homemade Twix Bars recipe has gone craaazy on Pinterest and so many of you have expressed your adoration for that recipe ever since it’s been posted. I know some folks have a never-ending supply stocked in their freezer for when a craving hits. Mad respect. It’s mildly shocking I haven’t created a twist on that recipe until now though, considering how dang delicious it is! It was time for a new version to hit the web and make you all hungry, though, and what better twist to serve up in the fall besides pumpkin spice?! 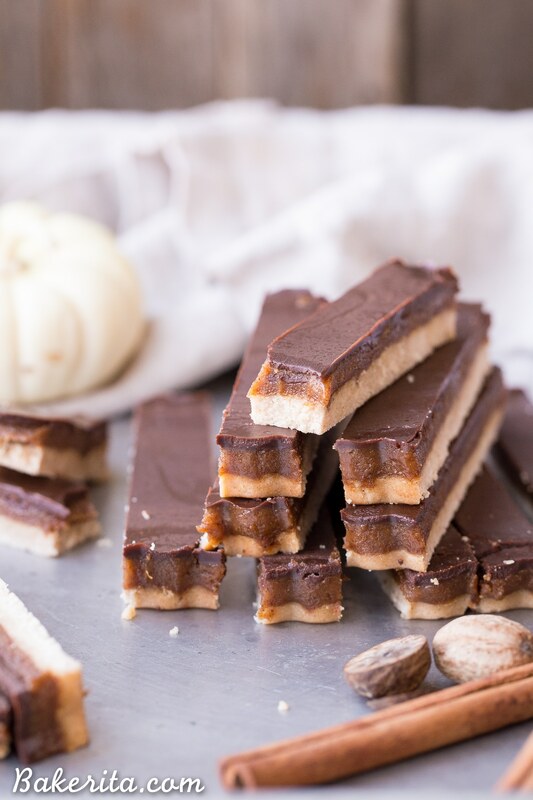 The crust of the Pumpkin Spice Twix Bars is firm and shortbread-like, and is the perfect base to the gooey caramel and chocolate toppings. It’s made with coconut flour, and because coconut flour is so uniquely absorbent, it helps give that shortbread-y texture. I wouldn’t recommend using any other kind of flour here; it just won’t be the same. Once you’ve got your crust baked up just how you like it, turn off the oven – the rest of the recipe requires no baking! Not really any cooking, either – mostly just stirring. The caramel filling is sooo simple, and starts with a base of just nut butter, coconut oil, and maple syrup. I used almond butter for the ones you’re looking at, but I’ve also tested these with cashew butter and I love it here too. The flavor of the caramel is amped up with pureed pumpkin (obvs), pumpkin pie spice, vanilla extract, and salt. The filling is poured over the crust and left to set in the fridge. While it sets, the chocolate is made, which is just as easy as making the filling. It’s made with maple syrup, coconut oil, cocoa powder, and salt, and all you need to do is melt, stir, and pour! That needs to set in the fridge too (I swear, waiting to set is the hardest part of this whole recipe) and then you can cut, slice and DEVOUR. 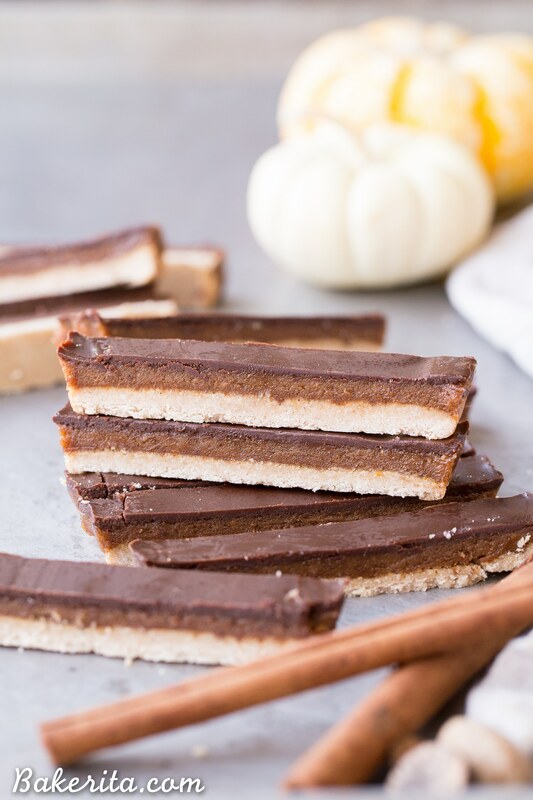 When you bite into one of these Pumpkin Spice Twix Bars, the chocolate topping and pumpkin spice caramel filling just melt in your mouth before your teeth sink into the crunchy spiced shortbread crust. I’d be hard pressed to find someone who doesn’t love these, whether they’re paleo, or vegan, or a gluten-aholic. I hope you’ll give them a try – enjoy! 3 tablespoons puréed pumpkin NOT pumpkin pie filling! Combine coconut flour, pumpkin pie spice, and salt in a bowl. Add the maple syrup and room temperature coconut oil and mix until a large dough ball forms, pressing out any clumps of coconut oil. Press the dough into the prepared pan. Bake for 10-12 minutes, or until light golden brown. If you want a crisper crust, let it bake for an extra minute or two or until it's more golden. Let cool completely. For the filling, combine all of the ingredients in a small saucepan or heat proof bowl and heat over low heat or in the microwave for 30 seconds until all of the ingredients are melted and thoroughly combined. Pour over the crust and let cool in the refrigerator until set, about an hour to an hour and a half, before topping with chocolate layer. You can also let set in the freezer if you're in a hurry! For the chocolate topping, whisk together all of the ingredients and pour over the cooled caramel layer. Smooth evenly and let cool until set. Slice into 1-inch slices, or 16 squares. Keep stored in the refrigerator. Prep time includes time needed for caramel layer and chocolate layer to set. Hello. These look delicious! Since my son is allergic to nuts (that is a big big problem) what can i use instead of almond/cashew butter? Hi Silvia, thanks so much! You could use sunflower seed butter instead of the nut butter to keep it nut-free :) enjoy! Nice combination of ingredients! Thank you for this awesome recipe. Hi Rachel! How long should it take the pumpkin caramel filling to set? Mine has been in the fridge for about an hour and still not setting, should i try the freezer? Hi Diana, you could definitely try the freezer – mine set somewhere between an hour to an hour and a half, if I remember correctly. I’ve updated the instructions to be a little more clear on that! Love your blog and recipes! Thank you for sharing. I’ve made quite a few! Can’t wait to try the original Twix. Coconut oil bothers my skin ironically , can I just sub equal part of another oil? (And if so what is the next healthiest oil you would recommend?) thanks!! Hi Erica, so glad you enjoy my recipes! You’d need to use an oil that firms up when cooled for the chocolate and the caramel filling. You could try using cacao butter or ghee…and most oils should work for the shortbread crust. Let me know what you end up trying and how it works out! Ummmm, pumpkin spice twix bars??? Where have these been hiding my entire life?? Rachel, these are beyond gorgeous and SUCH a genius idea for fall! Hi Emily, so glad you’re enjoying them! An extra two minutes or so in the oven will produce a deliciously crunchy crust if that’s what you’re after, just makes them a little more difficult to cut :) just wait until it’s nicely golden brown all over before pulling it out. Hi Denise, I always use canned pumpkin but you can make your own from a pie pumpkin too – here’s a link to how to do it: http://allrecipes.com/recipe/22935/pumpkin-puree/. If you’re looking for a way to use the remainder, I have lots of other pumpkin recipes and you can always freeze the excess for another time. What recommendations do you have for nixing the pumpkin? Thanks. Thanks so much Christina – I hope that you love them! Thanks Sabrina, hope you love them! Can I use regular flour for the crust? You could, but you’ll likely have to add a lot more to get the same result since coconut flour is so absorbent – probably between 1 1/2 cups and 2 cups. Just add it until it’s a stiff but spreadable cookie dough. Thank you for this great recipe! They are so delicious and easy to make!! Can I freeze them for later? Hi Tina, so glad you’re enjoying them! Yes they can definitely be frozen. 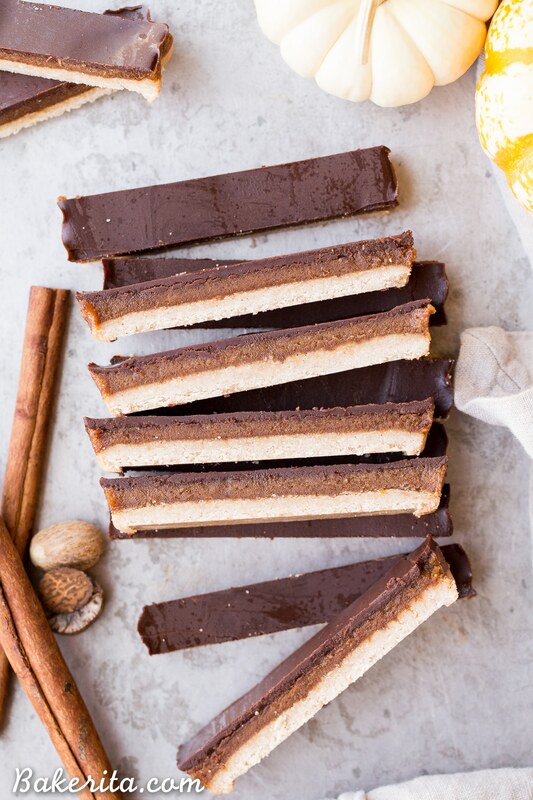 These bars look delicious and I’m looking forward to baking them however I am wondering if I would be successful if I used dairy butter (instead of almond or cashew butter) and canola oil (instead of coconut oil)? I’m not trying to be difficult and change the recipe but these items are not available in my area. Fortunately I do have coconut flour from a shopping trip to the “big city”. Thanks so much for your response and of course, for sharing this recipe! Hi Sharleen, canola oil would definitely not work because it is a liquid oil, whereas coconut oil is solid when chilled (which provides the filling with structure). Also, using butter would completely change the flavor…it would be very greasy and taste like butter, instead of more nutty from the nut butter. Sorry, but both of those changes would make the recipe be entirely different and wouldn’t work well. Thank you for the perfect gluten-free recipe! It`s very important for me. Thanks Milen, glad you like it!